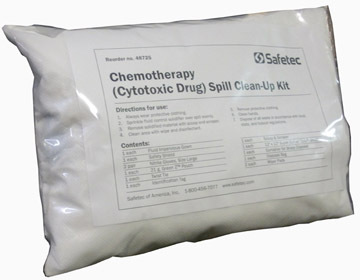 A Spill Kit designed specifically for the chemicals used in chemotherapy treatment. This spill kit is designed to protect and clean up spills involving Cytotoxic Therapy Drugs. Chemotherapy Kit features Green Z™ solidifier to solidify and contain hazardous chemical spills for quick and easy clean up and disposal with minimal exposure. The chemotherapy gown is compatible with OSHA recommendations, and ASHP and ONS guidelines for wearing a gown while prparing or administering chemotherapy drugs. The down is disposable, lint-free, made of low permeability fabric, constructed with a solid front and back closure and is long sleeved with tight-fitting cuffs.